How to make the easiest garden bed ever!! Kid style - no dig! 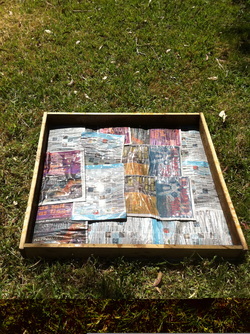 Start off by making a frame or edge for your garden. The boys made theirs out of old bed slats nailed together, but you could just as easily use bricks, rocks, logs or whatever you have laying around. We used an old bed frame and lined it with bits of corrugated iron for one garden we made. Find a good spot for your garden. Most plants like full sun, but a bit of shade is good in our hot Aussie summers. You can build this kind of garden on ANY surface. A brick courtyard, concrete slab, dirt, grass.....even in a styrofoam box or big pot if you only have a balcony. Line your bed with newspaper. We used old Drum Medias so got to read about the music scene while gardening - so very rock n roll! Soak the newspapers with water and be sure to remove any shiny colourful pages as they are chockers with chemicals which aren't great. 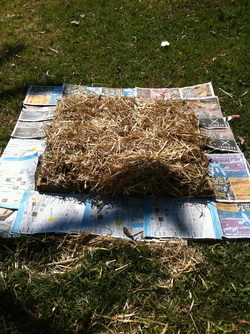 Make sure the papers overlap as this acts as a weed mat as well as composting down over time. Sprinkle some lovely compost over the paper. 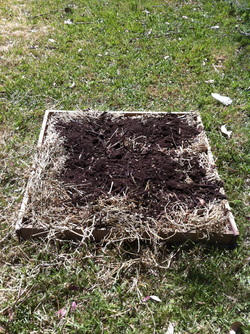 This will attract worms and activate the decomposition process. Compost is easy to make as well - just put food scraps, shredded paper, mulch, straw, grass clippings (pretty much any organic material) into a container that breathes, turn and water it regularly, add some compost worms and hey presto! 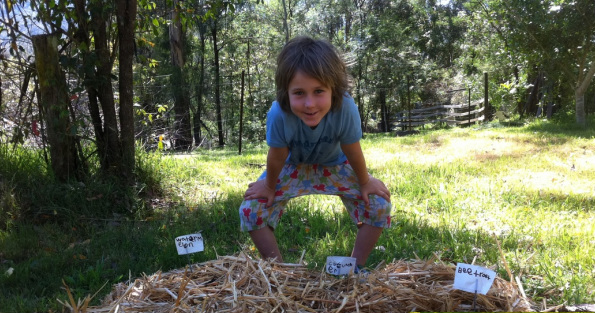 You will know your compost is ready when it doesn't smell bad and is quite crumbly. Lay down some lucerne hay. This is about $12 per bale. It breaks up easily into 'biscuits' - lay these out closely side by side till they fill the garden bed one layer thick. 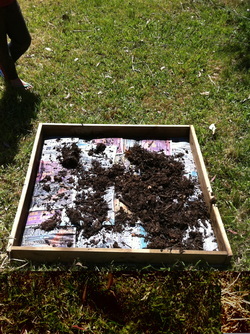 Then on top put more 'activating' material - mushroom compost, worm castings, well rotted manure and/or compost. Water well. Now top the whole thing with straw - at least 15cm deep. This will compact down and be the mulch. Make a 'path' around your bed by laying down more weed mat (cardboard, newspaper, old rugs) and covering with barkchips, gravel, pebble - whatever suits you aesthetic and budget.